Been trying to find this deal for a few days. Walmart was out and when I was in Superstore a few days ago they were still regular price. Back today and they were on sale, yay! Unfortunately Superstore only had one left – but happy I was able to get one rather then none. Looking forward to trying it out. 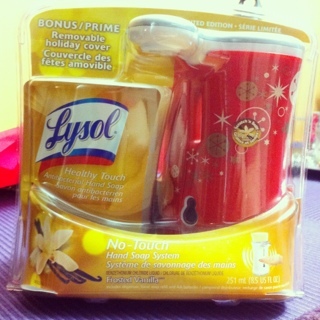 1 x Lysol Healthy Touch No-Touch Hand Soap System $4.94 – $5.00 (adjusted) printable smartsource.ca coupon (no longer available) = FREE! It was on clearance because it is the Christmas version, but it says the Christmas cover is removable so hoping I can use it all year. It is a french vanilla scent. Heard good things about these! This entry was posted in canadian coupons, coupons, deals, free, superstore and tagged canadian coupons, coupons, deals, free, superstore on January 4, 2012 by Courtnie. I tried to find these, but I was too slow. Thanks! So happy that I was able to find one. :) I was wondering if Zellers would have them but I haven’t made it there to check.